It’s been three weeks since Dilton and Ben died and nothing crazy has happened since, but things are certainly brewing in Riverdale. After a post-coital discussion in Dilton’s bunker, Jughead realizes he and Betty are missing the rules to the game, which might help them solve the mystery. Thankfully Ethel has returned to school after her seizure and even though she’s on some pretty heavy meds to help keep the seizures at bay, Betty and Jughead decide to talk to her again as she’s the only link left between Ben, Dilton, the Gargoyle King, and the game. It becomes pretty clear that Ethel doesn’t think of Gryphons and Gargoyles (or G&G) as just a game but something more real life. It’s almost as if she believed this is some form of LARPing. She’s upset that her (not) boyfriend Ben betrayed her to “ascend” with Dilton and finish the game with him instead of with her. She does, however, have the rulebook (or scripture as she calls it) and Jughead can play the game with her to get it. Betty is not allowed as she is not and never will be worthy enough. Jughead meets Ethel in the bunker to play the game and it starts out very similar to what I think of as Dungeons and Dragons (I’ve never played, so I can’t be sure), but it suddenly takes a turn to where Jughead has to flip a coin to choose the goblet to drink from. This is a requirement of the game to prove worthiness in order to get the treasure. Jughead flips and drinks and thankfully, nothing happens but he is also required to kiss Princess Etheline in order to get his treasure. When Jughead isn’t looking, Ehtel grabs the other goblet and drinks. Jughead manages to catch her in time and get her to the hospital before anything bad can happen. As Ethel wakes in the hospital cuffed to the bed on suicide watch, she swears to not tell her parents about the game and if Jughead does, she will say he’s the one who prepared the goblets. If that wasn’t enough, she seems to have made a copy of the rulebook and them placed in everyone’s locker at school. This after telling Jughead she was giving him the only copy. All of this at the behest of the Gargoyle King who, apparently, can meander around a hospital unseen to visit Ethel. Veronica’s speakeasy, La Bonne Nuit, is officially open for business thanks to some much-needed prodding from bestie Betty. And just in time because Pop’s is hemorrhaging money like no tomorrow. 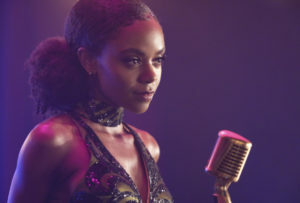 There are a few housekeeping things to take care of before opening night: only mocktails to be served, Kevin Keller will be the emcee for the venue, and Josie McCoy is the resident chanteuse for the club. And it’s worth mentioning that Veronica gets a visit from Penny Peabody offering protection as well as a large supply of Jingle Jangle just as Sheriff Minetta shows up to do his inspection of the club the following day. He’s accepting donations as well. 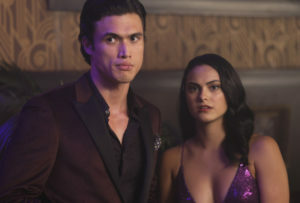 This leaves Veronica fuming at her father and she’s after some leverage to get him off her back. Thankfully, Toni and Cheryl are available to assist! Rumor has it that Hiram set up a Jingle Jangle lab in the basement of the Whyte Wyrm and as a former bartender at the Whyte Wyrm, Toni knows all the ins and out of the place. The trio is more than successful at nabbing some excellent blackmail photos and Veronica successfully manages to persuade her father to withdraw (for now) his offer of “help.” Hiram also shows up on opening night with a gift: his portrait of Veronica that hung in his office which seems much more at home at the speakeasy. 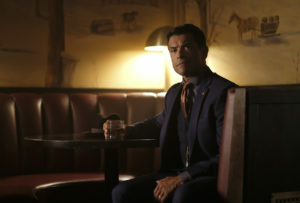 Veronica invites Hiram inside and we can tell he’s proud of her, even if they are at war. It’s safe to assume he cleaned up his little drug lab and moved it elsewhere so Veronica won’t get her $10,000 in perpetuity for not sending those photos to the FBI. Darn. Archie is in solitary confinement and he seems to have been put there after the riots three weeks ago. His father Fred isn’t allowed to see him and Archie is also refusing to be Mad Dog’s replacement for the warden. This leads to Archie being kidnapped from his cell in order to be persuaded a little further. After placing a sack over his head, he’s taken to a place called the Pit, which looks like it could be the pool area for the now-defunct Southside High. There’s a small platform at the deep end of the empty pool and Joaquin is getting an absolute beat down while spectators watch and wager on the fight. In order to save Joaquin’s life, Archie steps in to be his replacement. The following day Archie is put in a yard with other inmates, all fighters and working out, where the rules are laid out: the warden sets the fights, the guards place the bets, it’s bare knuckles until knockout, and while the kids don’t get paid profits, they do get some perks. Archie has his first official fight and knocks the guy out in two blows. Needless to say, the crowd is displeased the fight ended so suddenly and the warden makes sure to tell Archie to make his next fight, an easy fight, last for five or six rounds and to savor the punishment he will inflict. If that wasn’t creepy enough, Archie is handed a bottle of Lodge label rum for his second victory after giving the crowd “a show.” I should also mention that Archie came back to his cell to find Mad Dog’s hand me downs, which Archie promptly trashes in frustration and anger. He does manage to find a rock hammer concealed in one of Mad Dog’s books and decides he and the others should break out of the prison. I’m all for this. Betty comes home to find a few members as well as Evelyn Evernever from the Farm at her house. So many people are there but none of them are Edgar Evernever, much to Betty’s disappointment. The people from the Farm want Betty to give her “testimony” which means to spill her secrets. The whole group present already knows about all the literal dead bodies and dirty laundry surrounding the family thanks to Alice’s testimony. Apparently, they know everyone’s secrets. Betty point blank refuses to cooperate, demands to see Edgar and accuses the Farm and the Evernevers for being responsible for the Gryphons & Gargoyles game. Needless to say, Betty is gobsmacked to find out that her own mother told people from the Farm about the game and neglected to tell her, she nearly faints again after taking it all in but recovers herself. Plus Alice won’t tell Betty about the game because she trusts the Farm more than her own daughter. 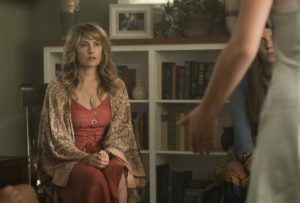 FALICE LIVES!!! I guess the Farm is good for one thing. Speaking of the Farm, it sounds similar to Scientology to me. Archie has a mental pep talk with his dad about the fight and having to put on a show. Reggie appears to be the house manager for La Bonne Nuit and did an excellent job of getting rid of the Jingle Jangle before Minetta came down to do his inspection. Do you think the code “642” to get into the speakeasy means anything? Archie requested burgers from Pop’s after his first big win and shared with the other guys. Awww. The whole episode was filled with burns. Watch and choose your favorite.